Now this is a cool review! Good job! For a lot of people in North America they would think Final Countdown was there debut. Back than I always thought Wings Of Tomorrow was there debut. Great find…. Man this is neat Mike …. Thanks man. I have liked the album for a long time. Then I read Martin Popoff’s 10/10 rating. He doesn’t just throw those around lightly. So I listened more intently and just got really heavily into it. Oh boy. I do remember when they released this. They started quite a stir with this record. I dunno if you know this, but the reason Europe were signed was because they won a contest and first prize was to make a record. Back in the early 80’s, all Swedish bands were pop bands that sung in Swedish so when Europe (they were called Force back then) entered the contest, they were a bit of a laughing stock at first because nobody took a Swedish hard rock band that sang in English seriously. Do I need to mention that all the other bands that were around at the time never went anywhere and they are now driving taxis or working at McDonalds…? Except for Per Gessle who formed Roxette and became a multi millionaire. 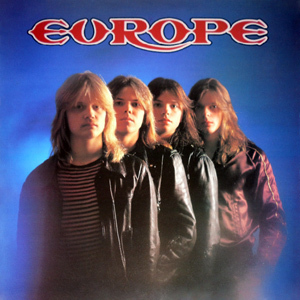 Anyway, I never got Europe at first, thought they were too cheesy and I was a metal head, see. I became a fan with Wings Of Tomorrow and when I finally accepted them, WOT had been out for ages. But this a killer review, Mike and it’s really cool that there’s someone outside of Scandinavia who actually knows about this record. No matter what, if you’re a Europe fan, you cannot not own this. Oh, yes, the cover you posted isn’t the original cover. This is how the cover looked when the album was released. I like the original cover much better. I’m not sure what the 1989 cover is supposed to be! Funny that they put the drummer up front on the cover, and the singer and lead shredder are stuck in the middle. Perhaps Europe do sound like new beginners at this point. But I think that is one thing I like about it, the sheer energy and youth. Sometimes that’s a real big boost. It is for me, listening to this one for sure. Yeah, well they were really young when they recorded it. 19 years old. Oh yeah, it is Norum that sings with Tempest at the end of Memories. Jon would you be able to answer what a “boyazont” is? Or is it a made up word? Haha. I have no clue. Great review Mike. Like others have said, shedding light on an overlooked album. I know about this one but my Europe CDs only go back as far as Wings… I know a couple of songs from the Rock the Night comp and from them I wouldn’t have guessed this would be a 5/5. I’ll have to keep an eye out for a copy! As I mentioned to Deke Popoff rated this one 10/10. That’s when I paid closer attention. It may only be a 3.5/5 for some. Well if you and Popoff are giving it full marks then that definitely puts it on my wish list. Fair enough! But be forewarned: I hate when people buy my 5/5’s and don’t like them. So you better like it. Or I’ll be very upset. And curse. It’s OK. If I don’t like it I’ll just blame Popoff instead. I am fine with that as a compromise. My customer Shane never forgave me for telling him to buy Nuno’s first solo album. There’s an RST about it somewhere. Yeah, I knew nothing about this. And the newer cover? Well clearly those are angel boners, raised in salute to some huge Europe-an government or monarchy. The double schwing salute! The cover shows a church (Karlskirche) in Wien/Vienna.